Emergency vehicles are over run with equipment in the console. The SA-500M Cruiser Siren from Carson Sirens is a 200 watt capable Mechanical siren that is rugged and reliable just like all Carson Sirens. 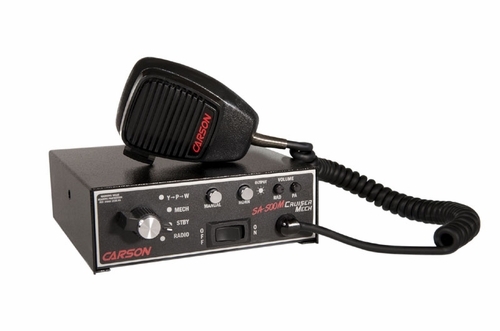 It is the smallest full featured 200 watt Mechanical tone siren that is available anywhere! At only 2 1/8 inch tall, this bulldog rugged console mount siren was designed to easily fit into a police or ambulance console or even a dash and still use much less space that allows you to install other equipment like a switch box. Not only is the siren small in size, but it has a huge sound. This is one firefighter siren that has the capability to change the way the drivers perceive your vehicle that is approaching them and requesting the right of way. The realistic sounding mechanical tone and the "Stutter Air Horn" the SA-500M Cruiser firefighter & firetruck siren makes drivers thing that a huge engine or truck company is coming so they instinctively are more apt to grant you the right of way that you are requesting. The effectiveness at clearing traffic IS KEY in helping to improve safety by reducing emergency vehicle near-misses, and reduce response time so that you may get to the scene quicker.